The Dropkick Murphys "I'm Shipping Up To Boston #1 Tune in Rock the Hub best-song competition! 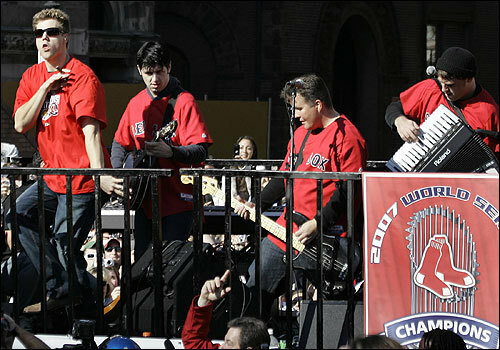 Boston-based punk band The Dropkick Murphys was featured in the Red Sox's celebratory rolling rally on October 30th. Their hit, "I'm Shipping Up to Boston" (with lyrics by Woody Guthrie), is Red Sox closer Jonathan Papelbon's theme song. Papelbon, as promised, did his Irish jig atop the duck boat floats. **Due to continued success in Manhattan at the IFC Center, the New York City theatrical run of PETE SEEGER: THE POWER OF SONG has been extended another week through November 15th! I Love NY - "This Land Is Your Land"
The performance at the Woody Guthrie tribute at the 2006 MerleFest. FestivaLink’s recording, which includes Pete Seeger and Nora Guthrie, is the only recording of this material available anywhere. Sampler of the Tribute to Woody Guthrie at the 2006 MerleFest Festival. Sophie Maslow (1911 - 2006) and Woody - Nora Guthrie shares the story of Sophie Maslow's relationship with the Guthrie family. The Paris Review: Woody Guthrie’s art is featured on the cover of the Summer 2006 Issue. The article,“Woody Guthrie, Rattle My Rattle”, focuses on Woody’s use of art to illustrate his various texts. The Sound of History: Music, Culture, and the Labor Movement, an article by Dave Elsila that tells how Woody's 1913 Massacre inspired a new musical documentary of the infamous Calumet miner's strike, was published in Allegro, the newsletter of the Associated Musicians of Greater New York Local 802. Nora Guthrie talks about Woody Guthrie ArtWorks on the Leonard Lopate Show on WNYC Radio. THIS LAND IS YOUR LAND, a new musical created for children, is being performed in 600 schools throughout Vienna, Austria. Created by musician/actor, David Lutkin, the show was selected by Vienna's English Theater as part of their English language program. New York City actress/singer, Helen Russel, will be appearing in the performances as well. Both David & Helen first appeared in the off-Broadway production of WOODY GUTHRIE'S AMERICAN SONG. CLAUDIA MARSHALL (WFUV Radio) received a Front Page Award for A Woody Guthrie Hanukah her interview with Nora Guthrie, music by The Klezmatics. Congratulations Claudia! DAVID AMRAM performs at Okemah's 2005 Free Folk Festival. Read David's Report from Okemah. JOHN HERALD (1939 - 2005) - Hark! My HERALD angel sang, written by Nora Guthrie. WOODY GUTHRIE SUBSTATION DEDICATION SIGN EXHIBITED by the Bonneville Power Administration in Vancouver, Washington. Today (July 13, 2005) we have framed the Woody Guthrie Substation sign and placed it in the flag plaza in front of our Transmission Business Headquarters building in Vancouver, Washington. Nice gift to you all for Woody's birthday! We looked for an appropriate way to display the sign, which is 13 feet long and 2 feet wide. Our shop craftsmen made a frame for the sign out of electrical substation materials. We also framed a picture of the original substation and a dedication plaque to explain why the sign is exhibited. Yet another honor here in the Northwest dedicated to Woody. SMITHSONIAN FOLKWAYS RECORDINGS now available Online at Microsoft's MSN Music Store. 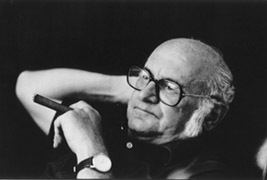 30,000 songs including Woody, Leadbelly, Pete Seeger, and Harry Smith tracks are now available. Single songs - 99 cents, Complete Album - $8.91. Available thru September. Listen to filmmakers Ken Ross and Louis Galdieri discuss upcoming documentary 1913 Massacre on "The Illinois Labor Hour" WEFT. Visit 1913massacre.com. The Oregon Cultural Heritage Commission rated Woody's Roll On Columbia Songbook in the Top 100 Best Books About Oregon. Guthrie Castle opens to the Public - A castle in Angus, whish is owned by an American businessman, is to open to the public for the first time. 535-year-old Guthrie Castle has been owned by Daniel Pena for 20 years and he says he had always planned to allow some of the public in to view the hidden gem of the castle and its large estate. But it is not being opened to all members of the public, only selected groups and for functions such as weddings. The Guthrie name is thought to derive from "Guthrun", a Scandinavian prince who settled in Scotland at the dawn of history. In 1299, Squire Guthrie was sent by the Northern Lords of Scotland to France at ask William Wallace to return to Scotland to resume the fight against the English. The castle was built under a warrant from King James III in 1468 and remained the Guthrie family residence until 1984.